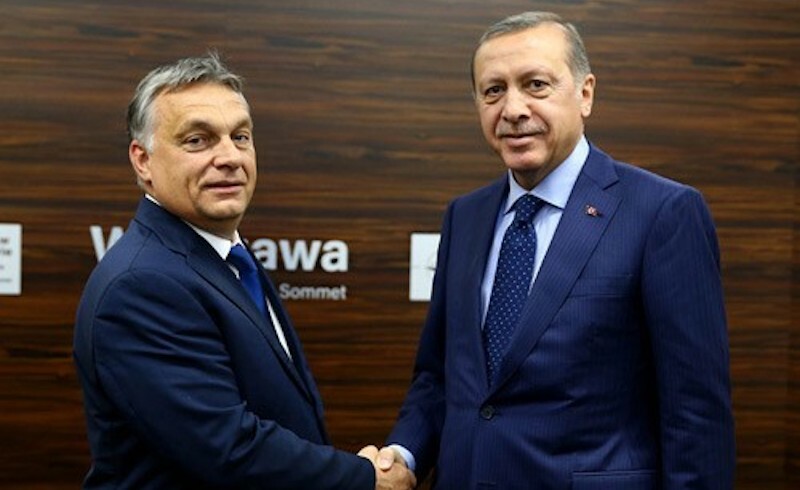 Hungarian Prime Minister Viktor Orbán and Recep Tayyip Erdoğan shake hands at a NATO summit in Warsaw, July 2016. Yes, of course, we are all indignant and horrified and incredulous and ashamed: the death and decomposition of the international state system causes mayhem and suffering that defies reason and imagination. Everybody has seen the wordless statement of UNICEF: they could not find words to express what they have seen and what they have felt. Various ethnic and political groups in Syria are killing each other and they are also killed by the states of Turkey, Iran, Russia, the US, Saudi Arabia, Israel, and others with weapons sold by EU members. The egalitarian, feminist and socialist enclaves created by the Kurdish left are attacked with particular ferocity by Mr Erdoğan’s army. It is the logic of media reporting (by no fault of the press: people cannot digest too many atrocities, it’s just human nature) that the new massacre makes us forget the massacre begun yesterday. The unimaginable horror of Syria where you really cannot single out the worst butcher among so many will create a smokescreen behind which the different kind of horror of the Turkish dictatorship is conveniently hiding. The Rohingya of Myanmar are barely mentioned any longer. Yemen is forgotten. The new dangers in the Congo are retreating into near-invisibility. And everybody else is complaining, too, even in relatively peaceful and rich countries where the last vestiges of bourgeois democracy are vanishing and where racism and xenophobia and ethnicism are taking over. These latter are régimes of fear and hatred. But who is feared and who is hated in this Europe where it is my fate — you might say, my good fortune — to live? In my country, Hungary, there are no refugees from the Near East, but the nation waxes hysterical over the danger of Islam. At the same time, the leaders of my country are befriending Arab and Turkish billionaires. One of them, Mr Adnan Polat, an ally of Mr Erdoğan, is an informal adviser to our prime minister. Money is always welcome. There are a few internet journals financed by our government which show constantly how in the despised, soft, decadent "West" the Muslims, the Asians, the blacks are taking over, that the French, the Germans, and the Belgians already live in a caliphate. At the Serbian border, at an entry point in the famous anti-migrant fence, the Hungarian authorities will examine the credentials of two (not two thousand, but two) immigrants a day to see whether they would qualify for refugee status and they are usually rejected and sent back. Yet the population trembles. In April, we’ll have parliamentary elections here. All parties reject the modest immigration quotas proposed by the European Commission and all are in favour of the infamous border fence, but still, the number one topic in the so-called election campaign is the "migrant problem." The few of us who try to resist the xenophobic madness are called, what else, traitors to the nation and we are called by some of our leftist brethren like my old friend Slavoj Žižek, frightened by public opinion, sentimentalists ("beautiful souls") who are forgetting the class struggle in order to weep at the sight of innocent suffering — hardly a heroic stance, surely. While the massacre of Ghouta is raging on, President Emmanuel Macron of France plans to "clamp down" on "illegal" immigration and tries, in the Napoleonic manner, to reform and "regularise" the Islamic religion in France to make it into one of the demure state religions recognised and chastened by the state. Meanwhile, the French right is up in arms because in some boring patriotic ritual the role of Joan of Arc is played by a young woman whose father is black. These are the preoccupations of the pre-eminent civilisation on earth (because that’s what it is, we know on best authority). It is not sufficient that fire and brimstone are visited upon the unfortunate in Syria and elsewhere, but those few who might escape, are greeted with rejection, suspicion, hatred, and contempt. All white (not only European) countries are vowing to fight gallantly against immigration, that is, against help to the needy and to the suffering. This is the moral stance that the heirs to the Renaissance, to Reformation, to the Enlightenment are now evincing. And what about our famous "democracy"? Is anybody doing anything about Erdoğan’s Turkey? We all know what is going on there, what happens to leftists, to democrats, to Kurds, to critical journalists, to opposition politicians, to dutiful civil servants, police officers, and army personnel. Mass demonstrations? Departing ambassadors? Severed military ties? Sanctions? Solemn condemnations? Special sessions of the UN Assembly? Exclusion from NATO? None of this, only using Erdoğan to beat Turks in Germany and Austria on their heads. Conflicts between Kurdish leftists and Turkish nationalists in European towns are cited against all immigrants of Islamic or "coloured" background, while peaceful demonstrations for democracy and the rule of law in Turkey in western cities are disrupted by Erdoğan’s thugs. A few days ago, a peacefully traveling Syrian Kurd, Mr Saleh Muslim, a leader of the PYD party, invited to an international conference, has been arrested in Prague. This was at the behest of the Turkish government. He is supposed to be extradited to Turkey — although he is not a Turkish citizen — on terrorism charges. He had a valid Czech visa that entitles him to some protection there; and we know what terrorism charges mean in Turkey. Anything — but chiefly nothing. We all know that thousands are in Turkish prisons on trumped-up or anti-constitutional charges; various real and imagined opponents of the régime; from opposition politicians, journalists, intellectuals and students to leftist workers, women activists or, simply, Kurds. One of the largest nations in the region, the Kurds — divided between Turkey, Syria, Iraq, Iran etc. — live and struggle for survival amid various circumstances and political situations, but they are denied (less so in Iraq) autonomy, embroiled in diverse alliances with sometimes opposed forces, but they are everywhere in danger. In these incredibly difficult conditions, some of them have managed to create enclaves of liberty and equality that should (but don’t) enjoy the full support of the European left. The spirit of international solidarity, once the pride of the left, appears to be moribund. All this is of course the result of the political disintegration of late capitalism where rational plans and strategies are practically non-existent. It is bellum omnium contra omnes, and even the little reason that in the past anti-establishment forces could inject into the senseless struggle has disappeared. An uprising of bad conscience is not to be expected. Tyrannies like that of Mr Erdoğan are tolerated by "the West" as "democracy" is not even an empty slogan where poor nations of the periphery are concerned. Small demonstrations before Turkish embassies are not worth much, nevertheless they should be held. For the moment we cannot do much more than shaming "our" governments and "our" European Union, but if this is the best we can do, we should do it, insufficient as it is. G.M. Tamás is a Visiting Fellow at the Institut für die Wissenschaften vom Menschen in Vienna.